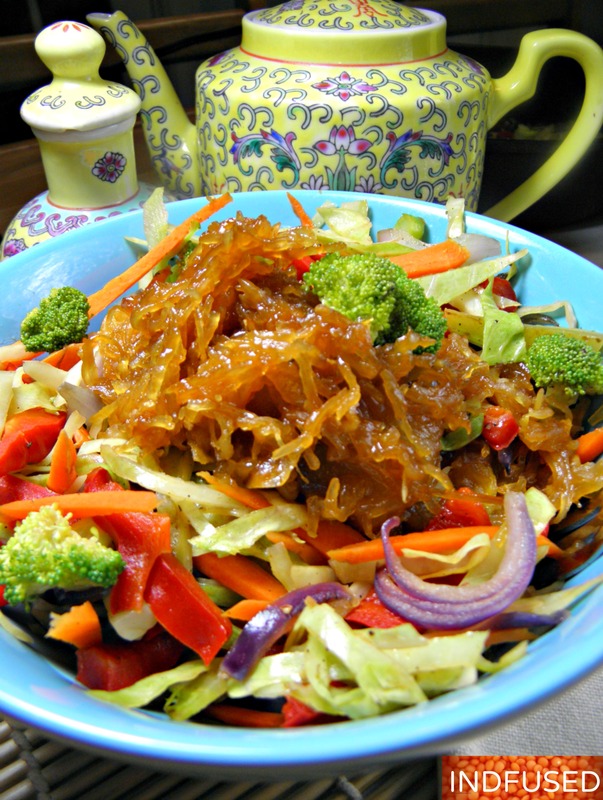 Gluten free spaghetti squash noodles and vegetables in an absolutely delectable Indian-American-Chinese sauce! Finger licking good ,vegetarian sizzler in a cast iron pan! Spaghetti Squash Noodles in a Spicy Honey Hoisin sauce! Oodles of finger licking good noodles! Are you, like me, trying to eat healthier between Diwali and Thanksgiving? If so, these spaghetti squash noodles will make it so easy for you! Please allow me to tell you once again about my long term infatuation with spaghetti squash. I absolutely am fascinated by this squash every time I scoop out the cooked strands. And besides offering a gluten free noodle option, the taste and texture of the ‘noodles’ make it a winner in my book! I roasted the spaghetti squash in the oven but it can also be cooked in the microwave as I did for the Scrumptious Spaghetti Squash Upma. I decided to combine it with another love of my life- hoisin sauce:) I love the Indo Chinese sauces too but they generally do not have hoisin sauce in them. So my attempt was to combine some of the flavors I love, in a sauce. To the hoisin sauce I added sriracha and soy sauce, Asian sesame oil, black vinegar, ginger, garlic and honey. Also, I made this in my favorite cast iron pan for the sizzler effect! The sauce caramelizes to make it even more finger licking good! 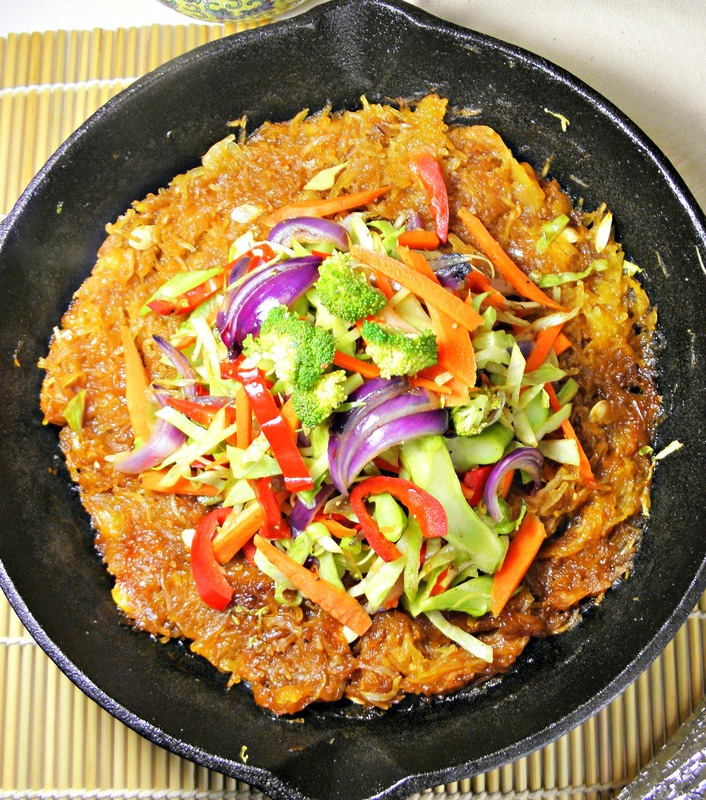 Spaghetti Squash Noodles in Spicy Honey Hoisin Sauce caramelized in the cast iron pan as it sizzles ! Then topped with the veggies ! Yum ! This recipe, needless to say, is going to be a keeper at our house! Here are the ingredients and the easy recipe! Spaghetti Squash ‘noodles’ and other ingredients lining up! Cut the spaghetti squash in half lengthwise and apply the 1 teaspoon of oil. Bake in a preheated 400 degree Fahrenheit oven for 40 minutes or until cooked. Remove seeds and fibrous center and harvest the spaghetti with a fork. Set aside. While the spaghetti squash is baking, combine all the ingredients for the sauce, stir well and set aside. Cut all the vegetables. Heat the cast iron pan, with the one teaspoon oil. Add the broccoli, carrots, cabbage, onion and red pepper in that order, stir, add the salt and pepper and stir fry for just a minute or until the vegetables are cooked but still retain their crunch. Remove from the pan. In the same pan, add the spaghetti squash noodles and the sauce and toss to coat the noodles. Let the sauce simmer on low for about 5 minutes to caramelize. Add the stir fried veggies back in the pan and remove from heat. Enjoy these noodles with oodles of flavor! Another winner from your kitchen to the blogging world Sandhya. I too love spaghetti squash, and here you’ve given us a different way of incorporating all those flavors. It is so colorful and bright, love your tea set too. Will definitely be losing calories if we eat these healthy veggies before Thanksgiving :). I’m happy to say, even though I was SOOOOO tempted to make all those Indian sweets that I saw on various blogs, I controlled myself. I did not even make one. I love pedas the most, I should try to make them when my girls are home over Thanksgiving. Thank you so much, Loretta! You are so sweet and kind, my friend. 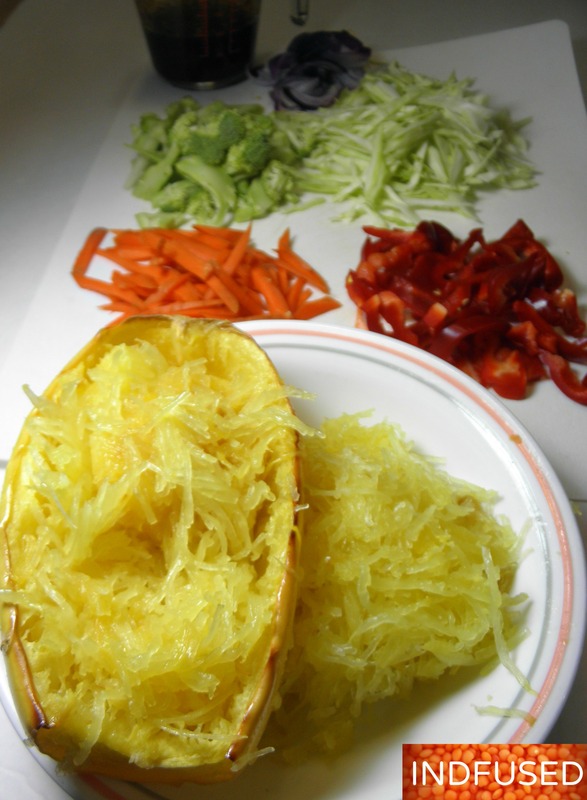 Love spaghetti squash, it’s such a great alternative to eating pasta. Tastes great and fools you into thinking you are actually eating noodles. Love the Asian flair sounds so so good. I haven’t been a fan of spaghetti squash, probably because I’ve always had other peoples’ flavorless preparations. This, however, I think I would like! Thanks Greg! Hope you like it! Linda, I would happily exchange it for the Prawns balchao! Thank you Judy. I am so flattered! Do let me know how you like it. The food tastes better in cast iron pans, doesn’t it? Yes, I absolutely love my skillet too. Thanks! We are hooked on these noodles now. I need good eating badly! Thank you Sonal! I am trying to eat better too. Thank you so much Vidya! I am so flattered! This sounds very nice! I love the squash and have wanted to try it! Lovely flavors! Perhaps this is how I will win my husband over to eating spaghetti squash. Great recipe. This sounds delicious, I have pinned it to try. I cannot get my arms around spaghetti squash with tomato sauce, I tried it and it just doesn’t mix well (in my opinion). This sounds like it will enhance the flavor. Liz, we liked it a lot. Do let me know how you like it. Love this stir fry, loaded with so many veggies, so many textures and flavors! Thank you Sharvari. Just make sure to cook the pumpkin tender crisp. I like that the spaghetti squash still has a little ‘bite’ to it and does not turn into mush. Let me know how you like it. I have never had spaghetti squash, as we don’t find it here, but love the wonderful dish you have created! Must taste fantastic!! Thank you Naina. I love the fact that the spaghetti squash, besides being so cool:), also retains a bite to the strands and does not get mushy. This dish was a hit in our home so will be making it often. btw, someone from Mumbai asked me what spaghetti squash is called in Hindi and all I could get from google is spaghetti kaddu, lol! Thank you Antonia! We really enjoyed these noodles. Are you getting busy with Thanksgiving preparations? Yes. I can’t believe it’s next week! How about you? It looks delicious. Like you, I also have a favorite cast iron pan. Foods cook wonderfully in cast iron. So true Sheryl! Food cooked in that cast iron pan somehow is more flavorful, isn’t it? We have all the ingredients for this in our cupboard! I am so excited to try out this sauce; I’ve never tried this combination before and it sounds so flavorful! This looks like a great simple and quick meal to make on a weekday. I find it hard to give up pasta though, so we will probably try it over some angel hair, egg noodles, or rice noodles. One of these days I’ll switch over to spaghetti squash..
Linda, Do let me know how you like the sauce. This is more in the style of the Indian Chinese fusion in India 🙂 Nikita loves the American Chop Suey recipe on Indfused too. So thrilled you are trying Indfused recipes! Lots of love to you dear!